Having heard the news on the radio, Sir Arthur Keith was prepared when J. S. Weiner and Kenneth Oakley dropped by late in 1954. "I know why you have come to me," Keith said, adding in a gallant understatement that it would take him "a little time to adjust to the new view." The proof that there had been a hoax saddened him less than the inescapable corollary that there had been a hoaxer. He told an interviewer from the London Times (January 9, 1955), "It left me in no doubt that the man I had the greatest reverence for had deliberately misled his best friend Smith Woodward and me." A minority of Piltdown historians has acquitted Dawson (F. H. Edmunds, Ian Langham, Francis Vere, Peter Costello). But to Keith, to J. S. Weiner, Wilfred Le Gros Clark, George Gaylord Simpson, the majority of scientists and historians, to newspaper commentators, to the lay public familiar with the Piltdown case, to Piltdown residents aware of the famous site in their village (not all are), Charles Dawson was the Piltdown hoaxer. On the Piltdown materials themselves, he stands accused of criminal negligence; on other prehistoric and antiquarian finds, of gross poofery; on issues other than his hobby, of real estate chicanery and felonious plagiarism. He was negligent in reporting the Piltdown finds. "Several years ago," he began his 1912 report to the Geological Society, thus ensuring a scramble to decide whether he had first asked the workmen to keep a sharp lookout in 1908 or 1905 or perhaps 1898. He specifies that he visited the place "shortly afterwards," which might mean 1908, and found a piece of parietal bone-or a workman found it and handed it to him or to Mr. Kenward. "It was not until some years later," that is, in the autumn of 1911, that he picked up a second cranial piece, a frontal bone  fragment, from "a spoil heap." The jawbone was exhumed "three or four yards" from a tree "on a warm evening in 1912." The canine-the exact date of its discovery jumping out from the usual slurred reporting as August 30, 1913-was in a "nearby" spoil heap. The elephant femur implement was under a "nearby" hedge. The same vagueness mists the reports of bones found at a site "some distance" from Piltdown and at Barcombe Mills. The reporting of Piltdown is a paragon of scientific precision compared with that of Site II. E590, the left parietal fragment, the first fossil retrieved from the pit, might have lain there for hundreds or thousands of years. In that case, no hoax yet. The exposé revealed that this piece had been dipped in potassium bichromate and an iron ammonium sulphate solution that converted its apatite to gypsum. Dawson stained fossils. In letters of January 1911, and July and August 1913, and February 1915, he informed Woodward of his doing so to preserve them. He sometimes used the solution recommended by Woodward's assistant, Barlow, and Barlow himself gave the  femur implement a bath in a hardening solution. As we present the various exhibits, we'll call upon witnesses for comment. Two witnesses testified to J. S. Weiner (their testimonies in The Piltdown Forgery, a book that Professor Weiner told me in May 1981 he had written hastily, to scoop Vere) that they had caught Dawson in flagrante delicto, staining fossils. We might recall Major Marriott (of the Royal Marine Artillery), who saw Dawson staining fossils. Marriott believed Dawson was "salting the mine," that he had faked the jaw and the canine tooth. Major Marriott told this to his family. A captain-St. Barbe-well-known at Sussex soirees, corroborated the major's recollections. One day in the summer of 1913, he walked into Dawson's office unannounced. Dawson, standing by a dozen porcelain pots, in his embarrassment explained that he was experimenting on methods by which nature stained fossils and flints. St. Barbe smelled iodine, which suggests that Dawson was using some solution other than potassium bichromate and iron ammonium sulphate. "The tale of boiling bones in Dawson's law office," said Mr. Robert Essex, "is a complete fairy tale" (Bowden, 1981). Essex, Science Master of Uckfield Grammar School, next door to Dawson's law office, and in almost daily contact with him, did not credit Dawson with sufficient knowledge of chemistry to accomplish such high-class fakery. Maybe, Essex speculated, Dawson had been trying to see if fossils could be faked. Dawson did mention the common solution, potassium bichromate, but not the uncommon iron ammonium sulphate. This may mean that he simply neglected to mention it, or that he deliberately avoided mentioning it-or that he didn't use it. A defender of Dawson's innocence, Malcolm Bowden, claimed that there had been sufficient sulphate in the pit to effect natural conversion to gypsum, and he said that the pit still contains 3.9 mg per 100 g of sulphate. The British Museum authorities, however, were unable to detect any. Which still leaves unanswered the problem of how the occipital fragment found or "found" at Site II also happened to undergo the transformation from apatite to gypsum. That fragment was on dry ground, no natural sulphate intrusion possible. Dawson possessed a cast of the Heidelberg jaw, which served as a model for the Piltdown fake. He may also have possessed the Piltdown skull. Florence Burley Pagham takes the stand. She recalled to the Sussex Express and County Herald ("1906 Skull Was Not the Piltdown Find") when she was sixty years old, that Mr. Dawson had visited her father in 1906, when she was thirteen. Her father gave Dawson a brown skull lacking a jawbone, with a single tooth in its upper jaw and a bruise on its forehead. Dawson said, "You'll hear more about this, Mr. Burley." Why Dawson confided to Burley that he intended to hoax the world and waited five years to do it, if indeed that's what he said and intended, can't be known now. What can be known is that the Burley skull had come from Ashdown Forest, and skulls don't fossilize in the sands of Ashdown Forest. (L. Harrison Matthews overlooked this when he wrote in his series of New Scientist articles that the cranial pieces in the pit came from the skull Burley gave to Dawson.) The interview was published on January 1, 1954, six weeks after the British Museum monograph broadcast the exposé, and after Dr. Weiner's strong hint that Charles Dawson had been the culprit. Dawson's dentist had the memorably Dickensian surname of Ditch. Dr. Ditch once shared a railroad compartment with Dawson. Dawson showed Ditch a jaw, or a cast of a jaw, and a canine tooth and asked where the canine tooth fit into the jaw. The implication of Dr. Ditch's testimony was that a man who didn't know where a canine tooth fit into a jaw could not have done the dental forgery. On the other hand, the hoaxer had before him the plaster canine tooth in the mouth of reconstructed Eoanthropus. The remodeling may have been more careless than crafty. Francis Vere, the foremost defender of Dawson's innocence, said of the mandible that it was "an utter-and not so clever fraud." An utter and not clever fraud lay within Dawson's anatomical competence. To deepen the mystery of the Piltdown coconut, we could use foreign intrigue. We have it in the form of a Tunisian radioactive elephant molar, a Maltese hippopotamus molar, and a Borneo sacred jawbone. We could also use some skeletons in a closet. Best of all would be a cabinet full of secret memoranda. Mr. Pollard was executor of the estate of one Harry Morris, whom we last met scowling during a talk with Arthur Keith. Morris, another of the many amateur naturalists exploring the weald and building up a collection of its mementos, had traded a cabinet for Pollard's collection of birds' eggs. J. S. Weiner, who spins the Morris tale in The Piltdown Forgery, went to visit Pollard to have a look at that cabinet. He rummaged through eleven drawers and found innocuous flints and eoliths. And then he pulled out the twelfth drawer. Morris had been in the habit of writing notes to himself. Stained by C. Dawson with intent to defraud (all). H.M.
Stained with permanganate of potash and exchanged by D. for my most valued specimen!-H.M. I challenge the S K Museum authorities to test the implements of the same patina as this stone which the impostor Dawson says were "excavated from the Pit!" They will be found [to] be white if hydrochlorate acid be applied. H.M.
Judging from an overheard conversation, there is every reason to believe that the "canine tooth" found at P. Down was imported from France. Morris did not bring his suspicions about imposture to the South Kensington (British Museum of Natural History) authorities. Considering that Barlow, Woodward, Keith, Smith, the top men in the field, all were on Dawson's side, one can sympathize with Morris's prudence. A rebuttal witness might respond that Morris's notes indicate no more than his hostility toward his famous contemporary and sour anger at having been conned in a flint trade. That is not a strong rebuttal: Morris's testimony fits in with Major Marriott's, Captain St. Barbe's, and that of the exposé. All those who believe that Dawson was the culprit think that he had or could easily have acquired the requisite chemical and anatomical knowledge. But then, any of the suspects fit that bill. The feature of the profile best satisfied by Dawson is being at the scene of the crime. He was the only person present at every retrieval at the pit during the years 1908 to 1914. The Site II finds force Dawson's defender into making up alibis. How could he have found the pieces in a large area? Stephen Jay Gould thought that Dawson could not have located the small fossils of Site II in a field as large as Sheffield Park (private communication, December 27, 1980). The Neatherall farm, which is a better choice for Site II than Sheffield Park, is not as large. Anyway, Dawson may have explored not square miles, but cubic feet. Woodward said that the stones through which Dawson sifted had been brought together in heaps, which would limit the terrain considerably. Dawson said he had "a friend" with him-the friend could have been the Piltdown hoaxer. The episodes in January and June 1915 could have happened as Dawson described them in his letter and postcard to Woodward. He could also have invented Site II. There is really no way of knowing. Others found fossils in fossiliferous places. Dawson picked them up everywhere. So did Abbott. Which brings us to the question of whether there's anything in Dawson's rap-sheet, whether he put over any fast ones in the years before Piltdown. In his September 21, 1984, letter to me, George Gaylord Simpson said he thought the hoaxer was Dawson, a bit of evidence being Dawson's having perpetrated a previous hoax. Simpson did not specify which item of Dawson's career was the one he had in mind. There's a choice. Much of what Dawson worked with has about it an odor of deception or at best inaccuracy. Although he enjoyed the prestige of being the Wizard of Sussex because he found archaeological treasures so readily, his finds prior to Piltdown were not always well recorded, well authenticated, or well received. In an 1893 excavation of Roman earthworks at the Lavant Caves in Sussex, Dawson's contribution was so disruptive as to irritate an associate into complaining that "the caves, it is to be feared, are now lost for all time and their secrets with them." (Weiner quotes this in The Piltdown Forgery.) After having botched that job, Dawson added insult to archaeological injury by failing to complete assigned excavations and write the requisite descriptive account. 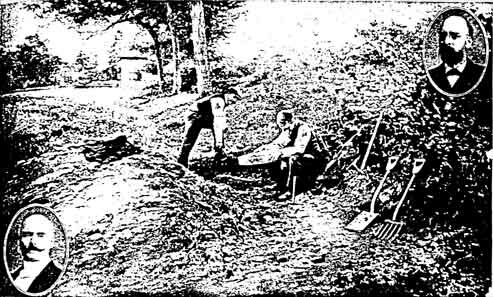 But in a 1909 dig for Neolithic skeletons near Eastbourne, Dawson participated in a careful investigation that followed the rules, including note-taking, measurements, and photographs. Woodward's professional specialty was not human evolution, but paleoichthyology. Dawson's amateur specialty was not human evolution  either. It was curiosities, discovering a cache of natural gas, experimenting with phosphorescent bullets to destroy Zeppelins, collecting medieval anvils, an oar mace, an ancient axe-head, a flint with a petrified toad squatting in it. He wrote to Woodward of a sea-serpent spotted cavorting in the English Channel, a creature as fabulous as the carp-goldfish hybrid or the horned horse he reported having seen. Consider the Pevensey stamps-not postage stamps, but stamped inscriptions on bricks that Dawson said, in an exhibit of 1907, he had retrieved some years earlier from the Pevensey Roman wall. The bricks were supposed to be 2,000 years old. Exposing these stamps to thermoluminescence proved that they had been made somewhere around 1900 (Peacock, 1973; the conclusion is disputed by Costello, 1985). The article on the stamps said that the fossil mammal Plagiaulax dawsoni " would repay scrutiny"-that is, there's a question about the authenticity even of Dawson's fossil finds. Dawson may have been duped on all of these things; or may have been overeager to accept anything as a fossil or an antiquity; or may have faked it all. Since 1885, the Sussex Archaeological Society, of which Dawson was a member, had met in and kept a museum at the lodge of Lewes Castle. The Society expected that when the owner of Castle Lodge, the Marquess of Abergavenny, decided to sell the house, the Society would have first option on the purchase. But another owner unexpectedly appeared and evicted the group. That new owner was a member of the Sussex Archaeological Society, Charles Dawson. The inference we are asked to draw is, 1 suppose, that a man who behaves like that is capable of betraying a close friend and risking his own reputation in the process. The argument is logically a non sequitur and offends against common sense. Rebuttal of the accusation against Dawson would also get to Dawson's using the Society's stationery. If he were posing as the solicitor for the Society, he would have used his own law firm's stationery. In using the Society's, he may have been exercising his privilege as a member (he often used stationery from wherever he happened to be) rather than his duties as a solicitor. On January 23, 1955, a letter by Mr. Salzman informed the readers of the London Times that Weiner's account of the conversation the two had had was "completely untrue." The Council had not "asked Dawson to act on their behalf in negotiating the sale to them of Castle Lodge." The Society moved to the Barcian Museum, where Piltdown never entered to take a place among other local finds. The Society did not allude to the Piltdown finds in its papers. It never invited Dawson to speak to it on the Piltdown finds. It was not represented at his funeral. But in 1928, it did exhibit a cast of the Piltdown skull, and at the memorial service in 1938, the president of the Society offered to have his group maintain the national monument. In 1903 at Lewes and in 1909 at Hastings, Dawson exhibited a collection of iron artifacts for the Sussex Archaeological Society. In the collection was an iron statuette that he identified as having come from the Roman occupation, contemporaneous with coins from the reign of the emperor Hadrian. This cast-iron piece, it was later determined, was a Victorian reproduction of an ancient Roman statue. A contemporary antiquarian wrote of Dawson's description, "The greater part has been taken from an early writer, Topley, almost word for word without acknowledgment." Though Weiner quotes this-Weiner is a loaded source of defamatory quotes against Dawson-the paper on iron works is a small thing. Dawson's History of Hastings Castle, however, was a big, two-volume exposition. A contemporary reviewer criticized it as being inaccurate, badly arranged, and plagiarized. Mr. Manwaring Baines, curator of the Hastings Museum, located the manuscript copy of a report by William Herbert, who had been in charge of the 1824 excavations of the castle. Baines wrote to Weiner on February 19, 1954, that "half the material in Dawson's volume is copied unblushingly from Herbert's manuscript. . . . The rest is gross padding." Baines also had suspicions about the authenticity of the Roman statuette and of a sixteenth-century anvil Dawson had put forward as authentic. The idea behind this part of the accusation  is that if Dawson had plagiarized in writing on archaeology, he might also have plagiarized in using the Heidelberg jaw as a model for the Piltdown jaw. Taking a lead from Vere, we as laymen do not have access to the Roman statuette or to the anvil; and, if we did, we wouldn't be able to assess their authenticity as antiquities. And we are at a severe disadvantage challenging the British Museum paleontologists when it comes to assessing the authenticity or source of a hippopotamus premolar. But when it comes to The History of Hastings Castle, we are on the same footing as any of the authorities. In the preface, Dawson sets up his strategy: to present a series of records, data as given in original sources, a translation that will retain "all the vigour and beauty of the original draftmanship," that is, a compilation or anthology. He not only does not claim originality; he specifically denies that he aims to be original. He carries out his scheme of compilation through anthologizing records: registers, letters, appointments, declarations, petitions, confirmations, titles, grants, characters, decrees, and inquisitions. He alludes throughout to William Herbert, noting in one place: "The author in the compilation of the present work has made free use of this magnificent record." The accusation of plagiarism stands as not proven. Both defenders and detractors agree in seeing Dawson as observant, imaginative, an assiduous collector, but also careless, impetuous, eclectic, all the traits that together make up the true enthusiast. Woodward described him as having "a restless mind." To discover his character, we will move outward from the circle of relatives to contemporary friends and foes to more recent commentators, in the course of which movement we may be able to discover a motive. We should be prepared to listen to and perhaps interrogate a number of witnesses. My father never believed his cousin Charles had sufficient time free from his legal practice, or the training, to be an expert archaeologist (let alone an expert anthropologist too! ), but that "finds" had been planted ready for him. It was, after all, the age of first-class practical jokes. jaw bone in exactly the right place, to pare his teeth to ensure a perfect fit to the upper skull and disguise the whole in such a manner to deceive his partner, a scientist of international repute. Charles Dawson, he exclaimed in step-filial affection, was "an unassuming, thoroughly honest gentleman . . . . too honest and faithful to his research to have been accessory to any faking whatsoever." Mr Dawson and I were members of the Piltdown Golf Club. Let me tell you this. He was an insignificant little fellow who wore spectacles and a bowler hat. Certainly not the sort who would put over a fast one. accuse a dead man's memory and besmirch his name. How could they account for the fact a lawyer had such deep insight into dental anatomy and physiology that he could for years puzzle the greatest anatomists? Not one of the teeth was interfered with in any way by Mr. Dawson. The charges had been made to hide their own ineptitude. The sycophantic humility of the museum tradition had for the past 40 years been playing a hoax on public opinion. Now they made a scapegoat out of Mr. Dawson, who died in 1916 and could not answer back. He concluded, "Let them try to tackle me." The chairman tried to shut him up again. Fisticuffs were narrowly avoided ("Piltdown Man Hoax," 1953). What could have been Dawson's motive for conducting this hoax for so long? The one that comes quickest to mind is satisfaction of theory. The keynote of his character, as Weiner sees it, was a fascination with missing links, intermediate forms, a creature half-reptile and half-mammal, a fish half-goldfish and half-carp, a neolithic weapon half-stone and half-wood, a boat half-coracle and half-canoe, a unicorn. In a letter of 1909, Dawson wrote to Woodward that he was working on a new subject, the 13th dorsal vertebra. He thought that a skeleton at the Royal College of Surgeons was that of "a new race of man"-the chimpanzee has 13 dorsal vertebrae-and he asked Woodward to introduce the paper for him at the Royal Society. "I want to secure the priority to which I am entitled." Therefore, or of course, the construction of an anthropoid half-ape and half-human. Here, then is a record of fact which will continue to be read as long as Englishmen love the land of their birth. . . .As long as England can produce such men, her place in the Society of nations is assured. This makes ironic reading today, but during the heyday of Piltdown, Dawson basked in such praise. His spirit would have grinned at Keith's eulogy. Dawson liked to be stroked, and sometimes expressed a frustration at nothing happening. In 1909, he was "waiting for the big discovery that never seems to come." He was irritated by neglect; declining an invitation to a banquet, he wrote to Woodward that he had "a feeling that the G.S. are treating me shabbily" (February 8, 1914). He was annoyed at the leak of the canine tooth find to a newspaper; it undermined things. He apparently wanted to be in control of broadcasting disinformation. He wanted to secure priority and nurtured an ambition to be elected Fellow of the Royal Society. Dawson once alluded to the "secrets of the cellar," taunting some guests as though a pride of fossils lay down there ready to prowl over the countryside. The persona revealed in his essays, books, and letters does  not seem to be the kind who would engage in a hoax the immediate targets of which were his closest friends, Clarke, Woodhead, Woodward, and the doyens of the study to which he had devoted so much of his life, Keith, Sollas, Smith, and others less prestigious. Furthermore, he would have been the first one selected as hoaxer if the hoax had been exposed during his lifetime. To Millar and Krogman, that recognition alone would have prevented his getting involved in such tomfoolery; for, if he had been found out, that would have meant not only the end of his archaeological vocation. It would also have injured his professional career. An attorney found guilty of, or even suspected of, having uttered a forgery is not an attorney inspiring client confidence. His law partner in the Uckfield office (to which Dawson had moved after a time in St. Leonards, where Abbott lived) was Ernest Hart, who would become Official Solicitor of England. Dawson's reputation would have suffered even if it had been revealed only that he had fallen for a hoax perpetrated by someone else. He had no prevision that he would soon die. His waiting three years to inform Woodward of the first find, his casual mentioning of it in the first letter, his insouciance about the Site II finds, are inconsistent with the idea that he was fashioning a hoax. If he had lusted after satisfying his theories about early man or for recognition, why wait so long for consummation? Several times during the Piltdown event, Dawson had the opportunity to clutch at someone else's find or theory to support the authenticity of Piltdown and rejected those opportunities. He could have announced the first Site II finds in the winter of 1915, but did not. In Queensland, Australia, a fossil was found and named the Talgai skull. Some favored it as another eoanthropine. Dawson, however, objected, arguing that since the lower jaw was missing it could not justly be taken as evidence of eoanthropine status. Had he been the hoaxer, he would have welcomed the Talgai skull or at least have kept cunningly quiet. The best example of Dawson's rejection of a theory that would have boosted Eoanthropus is the position he took on the question of eoliths. Certain flints lend themselves to opposite interpretations: that they look like tools because natural agencies (being tumbled by water or subjected to pressure) shaped them or that they look like tools because people made them. Sollas and Boule and most of the paleontologists of that day (and of today) rejected the interpretation that these eoliths or dawn stones or old brownies were tools. But Harry Morris, E. Ray Lankester, Reid Moir, and Lewis Abbott preferred to consider them tools. If he were the hoaxer, Dawson should have gone along readily with  the party that looked upon Dawn Man as the maker of those dawn implements. But instead, in February 1915, Dawson began experiments to prove that natural forces could produce stones that look like artifacts. He took clumps of starch, dipped them in Barlow's spirit and shellac solution to harden them "as they are very crumbly and seemed ready to split up into other prismatic features or perhaps 'micro-eoliths'!" The next month, before an audience of the Royal Anthropological Society, he repeated the experiment. His clumps of starch, stained to simulate the mineralization color of eoliths, were put into a bag and jumbled. When he took the starch pieces out, they looked like eoliths. Therefore, analogous natural forces could produce eoliths, natural prismatic cleavages mistakenly seen as artificial flaking. Reid Moir tried to get at Dawson over these starch eoliths, but the most intemperate critic was Lewis Abbott, who seemed, as Dawson put it in a letter of March 9, 1915, "especially annoyed" and sent Dawson "abusive letters." Postlethwaite, Chamberlain, and Francis Vere concurred that Dawson could have been duped. According to Essex, one of the diggers had come looking for Mr. Dawson, who was at the time in court. The visitor had left his bag there, and the clerk had opened it. Inside, he found "a fossil half-jaw much more human than an ape's and with three molars firmly fixed in it." The clerk called Essex, who happened to be walking by, into the office and showed him this object. The digger returned and retrieved his bag. The clerk may not have replaced the jawbone. Sometime later, Essex met Robert Kenward. Kenward was looking for the owner of the bag, who was "distractedly searching for something he had lost." Essex is cryptic about what this all portends. The owner of the bag, whom Essex names X, apparently was trafficking in jawbones. When Charles Dawson said he had never seen anything like the "sixteen inch bat" found at Piltdown, Montgomery told him he had seen one in the Dordogne. Montgomery told me afterwards exactly how he saw it, but the point is that as soon as Montgomery said "Dordogne," Dawson's eyes glanced across to the nearby group of people, one of whom was the owner of the bag. Then he turned abruptly indoors. 1 am certain Dawson suspected something, although at the time 1 had no idea what he suspected. The owner of the bag may have transported the femur slab implement from the Dordogne to Sussex. But Dawson's recorded remarks (of November 21, 1914) on the implement do not reveal his having any suspicions that Mr. X had planted it. "It is not my business to pillory him publicly," Mr. Essex said of X. "He conceived a joke." Who was this mysterious bagman? Montgomery alluded to the Dordogne. A Morris note specified the provenance of the canine tooth as France. One of the suspects often traveled between his home in France and his seminary in England. But before we pursue the French connection and the identification of Teilhard de Chardin as Piltdown hoaxer, we have to take a brief detour to Hastings and environs, escorted part of the way by a pet goose.